I think that from now until forever, Pixar is going to be a big part of my life. From now until I get married and start a family, they will hold a very deep, special place in my heart. When Pixar began, it tore down the industry, arguably it still does today. Pixar back in 1995 not only created fun for the whole family, but the story was something everybody could relate to, even if you were a young child, a married person, or an unmarried person. There was something in each movie that spoke to you in the right way if you were willing to listen. With all of that said, I think it should be noted that we as Pixar fans need to get used to diminished expectations. It seems like Pixar had a golden age of storytelling during the years of 1995-2010. The "Toy Story" trilogy, "A Bugs Life", "Monsters Inc.", "Finding Nemo", "The Incredibles", "Wall-E," "Ratatouille," "Up" even "Cars" to a lesser degree are all grand story machines. Movies that are instantly recognizable as classics. Movies that could and did appeal to all. Now in 2011 on, it seems with thier sudden obsession with creating brands out of their brand, their stories have suffered a bit. "Cars 2," "Brave" and now "Monsters University" do not jump off the screen in the same way Pixar's predecessors did. 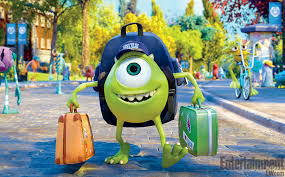 "Monsters University" opens with a flashback of Mike (Billy Crystal) as a child going on a field trip to Monsters Inc. Mike instantly drawn to the Scarers and their floor, the floor you remember from the first film. He accidently steps into a room and when he gets out he gets in trouble. However he impressed the Scarer who went into the room and from that point on, Mike grows up to want to be a Scarer, recognizing what he wants to be when he grows up. When Mike grows up he is accepted and attends Monsters University, the most prestigious of schools to attend if one wants to gain employment at Monsters Inc. And we are quickly reintroduced to Sully (John Goodman) who seems to be a know-it-all and the son of a legendary Scarer. If it was not predictable at first to think that Sully and Mike hate each other at first, they do. The rest of the movie feels like a retread to old 1980's college comedies. Sully and Mike's rivalry becomes so intense that their stay at Monsters University is threatened. And their stay is held in them joining the schools reject fraternity and overcoming their failures. There are points in this movie where Pixar really shines, but those moments are far and between. I never thought I'd put "Pixar" and "predictable" in the same sentence, but here I am doing it. It's not all bad, the animation is top-notch and lush like always. And director Dan Scanlon has taken each advantage to make this extended world unique and funny. Scanlon is also able to mesh comedy with storytelling with ease. I just wish that great storytelling wasn't absent until the last 40 minutes of running time. I feel if this story was nurtured more, Pixar and Scanlon could have created something truly remarkable and worthwhile. But they spent too much time creating something predictable genre fable and it doesn't have that extra punch Pixar is known for. What made the golden years memorable was how unpredictable the studio used to be, and I am not sure that unpredictability is present anymore. There is still much to enjoy from "Monsters University," but this will always be a movie that sits on the lesser category of the studio's filmography. And it seems from now on, moviegoers are going to have much more reserved expectations from Pixar.